← ASK FATHER: Poured Precious Blood down sacrarium. Go to a Missionary of Mercy? I know that the priests of the Institute of Christ the King nowadays take the title “Canon” and that Monsignors Wach and Schmitz are, well, Monsignors. Recently I have heard a few people independently doubt this, saying that they shouldn’t be called Canons and that the Monsignors aren’t real Monsignors. Neither explained to me why. As far as I have been able to research, they seem to have a right to these titles. I would be very surprised if the ICRSP would allow a flaw like that, since they are so precise in everything they do. I’m not sure why these people thought like this. Would you be able to shed any light on this? There are Canons Regular of St. John Cantius, the Canons Regular of the Holy Cross (associated with Opus Angelorum), Canons Regular of the New Jerusalem… to name a few of the more modern iterations of these ecclesiastical critters. There are lots of others, older ones, as well. A “canon” is a type of ecclesiastical person, a member of a chapter (such as a cathedral chapter or one of the basilicas in Rome) or body of clerics who live according to rule (regula) and who are presided over by one of their number. Historically canons gave assistance to a bishop and they were especially involved in the liturgical life of the place, particularly in the singing of the hours of the Office. Canons would dress like normal priests, although sometimes the Holy See granted the privilege of wearing other gear by a particular indult. In such cases, canons were not to wear any of their special gear outside the diocese to which they were attached or the place where they were based. In any event, a body of Canons must be set up officially either by the Holy See or by a diocesan bishop. I have looked through the website of the Institute and they do not use the word “canon” to describe their members. At least that I found. If they use the term “Canon” among themselves, I suppose this is an internal decision they have made, but it seems that the bishops who gave them their canonical status (D. Mouila and later Archd. Florence) didn’t set them up as Canons Regular. In 2008 they were recognized by the Holy See as a Society of Apostolic Life. They seem to be members, clerical and lay, in an Institute which technically isn’t precisely a group of canons regular. Also, I note that they call their lay members “clerical oblates”. An oblate is generally a lay person who is formally attached to an order or institute who gives support and service according to necessity. However, since Canon Law states that the clerical state begins with diaconate, and since the oblates of the Institute are not at least deacons, the term “clerical oblate” seems to overstate their situation a bit. If they have made an internal decision to call their oblates “clerical” because they have received the traditional minor orders, then, hey!, Quis sum ego ut iudicem? As far as the two men you mention, we must consult a recent copy of the official book of the Holy See, the Annuario Pontificio. If a priest has been made a Monsignor, his name appears in the index along with an indication of his diocese, the kind of Monsignor he is, and the date that level was conferred. Msgr. Michael Rudolf Schmitz is in the index. He belongs to the Archdiocese of Cologne, Germany, and was made a Monsignor, a Chaplain of His Holiness, in 1998, I believe during his service in the Holy See’s diplomatic corps. Giles Wach’s name does not appear in the index of the most recent Annuario to which I have access, which is the 2014. It’s possible that, subsequently, his status changed, but I don’t have the most recent Annuario. It should be mentioned, however, that Wach had once been Vicar General of an African diocese in Gabon, where the Institute still has ties. It was the practice that vicars general were, for the time they held office, given the use of “Monsignor” even if they were not monsignors so named by the Holy See. Thus, in the Annuario even today you will see under the listing for a diocese that “Mons.” is by the name of a vicar general even if he is a simple priest. This is an old rule of churchy etiquette that doesn’t confer the lasting, official status. In any event, what Institutes and Orders and Congregations and the like do within their own communities is hardly our business. They have their own rules and manner of life to which they commit themselves. They are known by their fruits. The Institute seems to be doing good work where they are planted and the number of their locations seems to be growing. Finally, since I am merely an outside observer of the Institute and don’t have much contact with them (not so much by my choice, mind you), if this doesn’t satisfy, you really should direct your questions to them. I can only offer here what is public knowledge. This entry was posted in Mail from priests, The Drill and tagged Annuario Pontificio, canons, canons regular, Institute of Christ the King. Bookmark the permalink. From what I know, they regard themselves as Secular Canons, a second type of Canonry that does not entail the vows Canons Regular take. As regards the Prior General, Gilles Wach, he is not a Monsignor like Mgr Schmitz. Wach used to wear prelatial costume for which he was reprimanded by the Holy See. There are photos of this. It is said that afterwards, he designed the choir dress of the Institute, but I have not researched that thoroughly enough to make an informed judgement. The courtesy title, of course, is another thing. Is there any new information on the efforts to restore the Shrine? Last I heard, donors had raised $450,000 to stabilize it and were in talks with the Archdiocese of Chicago. On October 7, 2008, the decree Saeculorum Rex established the Institute of Christ the King Sovereign Priest as a Society of Apostolic Life of Pontifical Right in the form of canons secular. On January 29, 2016, Feast of St. Francis de Sales, patron of the Institute, the Holy See gave its permanent approval of the Constitutions of the Institute. The proper form to greet a priest of the Institute of Christ the King would be to address him as Canon, together with the last name or just Canon. His title is an expression of our canonical lifestyle, thus giving the priests of the Institute the pontifical recognition of our Constitutions. Last year I met a canon of the Institute of Christ the King and realized I didn’t know how to properly address a canon. Is it just “Father”? Even the appearance of arrogation is the antithesis of humility. Sigh. at ordination though I don’t know any who use the honorific “monsignor” since it is seen 1. as not appropriate to those in religious life and 2. can cause problems when working in certain dioceses with the diocesan clergy. In ecclesiastical precedence Canons and Canons Regular fall after Protonotaries Apostolic and Honorary Prelates with the Canons Regular of the Lateran taking precedence within the orders of canons. Hope that clarifies it a bit. In French, priests of the Institute of Christ the King are addressed as “Monsieur l’Abbé”, easily confused with “Pere Abbe,” abbot of a monastery. Secular priests, too, are addressed as “Monsieur l’Abbé” in French. I think people might be being a bit legalistic because we don’t have the tradition of courtesy titles in America. The younger son of a peer might be styled “Lord Peter Whimsey,” but he need not be a peer of the realm to be so called, and is only, in essence, gentleman. Even if he is using a subsidiary title of his father’s, e.g. the Earl of Arundel, heir of the Duke of Norfolk. The same is true for many a Scots Laird. I think it was the case for Viscount Mulcaster; maybe someone could clear that up for me. Monsignor is an appropriate appellation for any bishop who is not also a Cardinal, as well as for others. Specifically I recall that Conventual Chaplains of the Order of Malta and the Order of the Holy Sepulchre are also properly styled monsignor, and those of the Order of Malta wear a purple mozetta (although maybe it’s a pelligrina since it has buttons), fascia, and piping on their cassocks . As with all such courtesies, it is a mark of respect, and we should show respect to all of our clergy, each one a member of the Second Estate, as it were, and there is no where a law restricting this usage only to functionaries of the Papal Household. If one were looking for the fons honorem for these courtesies, you could always be satisfied with the truth that all priests administer the reign of not just a king, but for the King of Kings. An ICKG priest told us once that they are “Canons Secular”. That is vs. “Canons Regular” such as the Society of St. John Cantius’ members. I do not recall the definition of “Canons Secular” but in the conversation understood it to mean “not quite as good” as “Canons Regular”, whatever that means. That said, they have very Holy Priests and good men. In my travels, I have determined that some of the other traditional groups have an issue with calling them Canon; whatever. As they say, “above my pay grade” :) Call them what they prefer to be called. I’m good with it. A priest friend of mine, and a really good guy, has a nephew in the Institute. It’s not my style at all, but it seems like he’s happy and that it works for him. The priest of the Institute of Christ the King Sovereign Priest are officially secular canon, by the decree Saeculorum Rex of 2008, definitely approved by the Holy See this January. They are addressed as “Monsieur le Chanoine” in France. This title is not meant to be merely honorific. The goal of the founders of ICKSP was to complete the wish of St Francis of Sales to create an order of secular canons, a sort of male version of the Order of the Visitation. The particularity of this Institute is that the priest are Canons, meaning their goal is the Divine Liturgy, especially through the recitation of the Divine Office in common at the choir, as opposed to a private recitation. The founders wanted for their priest a real community life, even in the apostolates throughout the world, and this is why most of the time and when it’s possible, there is at least 2 priest of the ICKSP in each apostolate. “A priest alone is a priest in danger” said Mgr. Wach in an interview in 2008. About Mgr. Wach and his title : the constitution Saeculorum Rex states that the Superior of the Institute is addressed as “Monseigneur le Prieur Général” (Monsignor the General Prior) and is elected for 6 years renewable. He stands as the Ordinary for all priest of the ICKSP, wherever their apostolate might be in the world (even though the bishop of the territory in which the apostolate is settled gets to authorize or refuse their presence). Also, even though Gricigliano (the headquarters of the ICKSP) is in the territory of Florence, this Institute is considered part of the Diocese of Rome, as they are under pontifical right since 2008. Finally, Mgr. 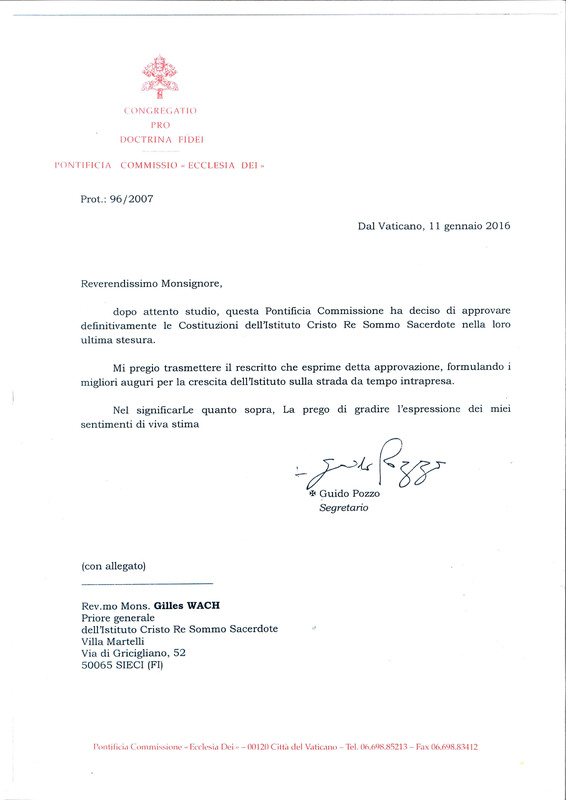 Wach is always addressed as “Monsignore” in official letters from the Holy See, as can be seen here : http://www.icrsp.org/Droit-Pontifical/2016/lettre.jpg. Please pardon my english, I am a French reader of your blog. I hope my explanations make sense. Cappamagna, merci beaucoup ! Votre anglais est très bien. Je vous comprends facilement. Je sais que Mgr.Pozzo appelle Mgr. Wach « Monseigneur » mais je n’avais pas vu la lettre. Dans le passé, « Ecclesia Dei » s’appelle « Rev.dus Dominus » . C’est la forme qui a utilisé quand l’Institut a reçu le droit pontifical en 2008. I have some knowledge of the Institute since I live in Liverpool between their 2 Churches in New Brighton http://domeofhome.org and in Preston http://www.stwalburge.org and have got to know them. I was not involved in any way with the Traditional Mass but they drew me and my wife in by their reverent liturgy and general attitude. In my experience they are a dedicated, hard working and extremely likable group of Priests which any Diocese should be glad to have. For a small group they have made a big impact in the North West of England and I hope other Diocese will invite them in. They do call themselves “Canon” because, as I understand, they try to live and to emulate a collegiate form of life as much as that is possible. For example they say their office in the evening followed by Benediction as part of their communal life but inviting their congregation to attend. My understanding regarding Mgr Wach is that the title goes with the office under their Constitutions which were definatively approved by the Holy See this year. Mgr Wach is the Prior General of the Institute and as in that role is entitled to the honorific title “Monsignor”. I’ve met him a couple of times on his visits to England though since he only speaks French and my French stops at “Bonjour” and “Merci” we have never spoken. The point is that he visits the Churches of the Institute, he keeps an eye on things, or to put it another way he works. I’m in agreement with Neil Addison, I also know them from the same places, plus I have a ‘spiritual son’ who is a transitional Deacon, he has been called Abbe from before he was a sub-deacon, so it’s not just a title used for priests, they are known as Canon (Chanoine in French, as mentioned above). A wonderful order in my experience.